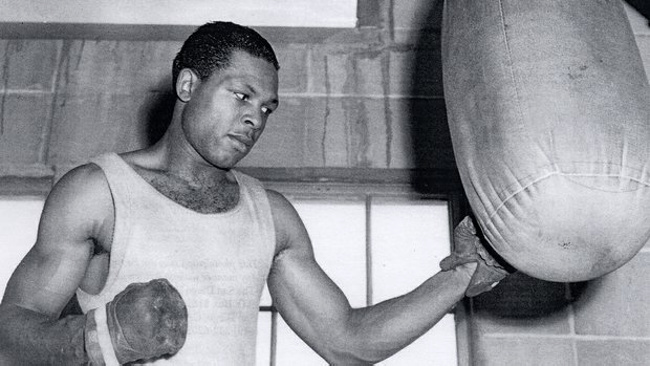 The story of Archie Moore is, above all else, one of perseverance. 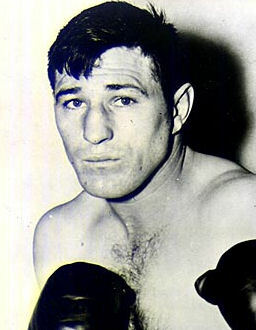 While generally not considered part of the famous “Murderers Row” gang — a group of skilled black boxers in the 1940s and 50s who were highly avoided, lacked mob connections, and thus never received title shots — Moore deserves honorary membership considering how long he had to wait for his just due. By the time he finally received a chance at a world crown, Archie had over 150 pro fights on his ledger and was 36-years-old. A man of lesser determination and strength of character would have given up long before. Though in fact, he did, and more than once, but Moore’s retirements were primarily expressions of frustration and never lasted long. After all, he had gone through so much during the early years of his career — including acute appendicitis and a perforated ulcer that almost killed him — that quitting didn’t make sense. Instead he went on to become boxing’s greatest “Methuselah,” fighting on until he was past 50 years old, and in the process amassing the most knockouts of any boxer in the history of the sport. When Archie did get that precious title shot, only after he had been boxing professionally for 17 years, he made good, striking durable Joey Maxim repeatedly with his powerful right hand and winning a 15 round decision and the light heavyweight championship of the world. Having finally reached the summit of his profession, one might have expected Moore to take a well-earned rest, but instead he did the opposite. Over the next six years he competed 43 times, mostly non-title matches, along with several defenses of his world championship and two unsuccessful attempts to annex the heavyweight crown. 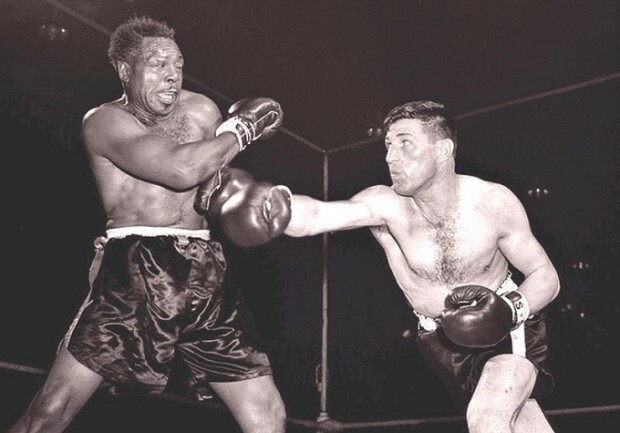 Moore finally wins a world title, defeating Joey Maxim in 1952. For a moment it looked as if “Ageless Archie” might be finished right there, but the badly hurt champion managed to just beat the count, only to be chased all over the ring and tagged repeatedly with heavy punches. He rose quickly from a second knockdown but Durelle then promptly floored Moore a third time with another clean right hand. Again, it looked certain Moore was done for the night and again, he just barely beat the count. It seemed Father Time had finally caught up to one of boxing’s oldest champions, and in most sudden and dramatic fashion. He was one solid punch away from being knocked out and yet a full minute remained in the round. Durelle did his level best to end it but with thirty seconds left it was the challenger who initiated a clinch after Moore connected with an uppercut. The Acadian’s great chance had slipped away and Archie was recovered enough to land a hard right just before the bell. His legs looked rubbery as he was helped back to his corner, but, incredibly, seconds later the 42-year-old veteran of over 200 fights was smiling and telling his handlers he was fine. And indeed Moore held his own in the second, clocking Durelle more than once with strong right crosses. But if anyone thought the opening round some kind of anomaly, Durelle proved otherwise and reasserted himself in the third when he put Moore on the defensive again. 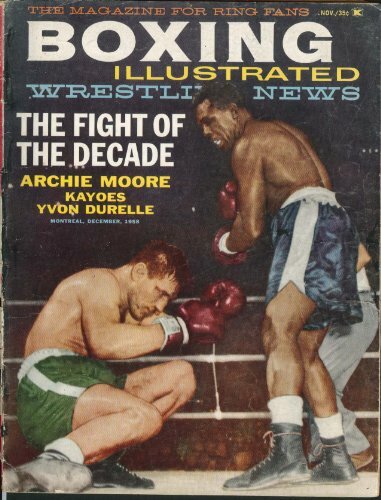 They traded on even terms in a furious fourth round, and in the fifth Durelle hurt Moore with a vicious right hand to the body before chasing Archie to the ropes and dropping him again with a crushing right to the jaw. Finding himself on the canvas a fourth time, how easy it would have been for the old warrior to surrender. Who would have faulted him? But any thoughts of quitting in the mind of “The Old Mongoose” were of the most fleeting kind. 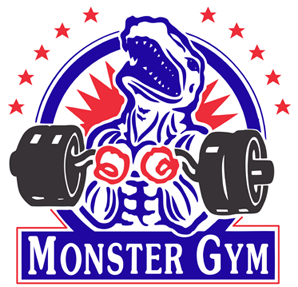 Up at the count of six, Moore was clearly in desperate shape again, but the champion’s courage and conditioning kept him on his feet and firing back as Durelle pursued and tried to finish it. 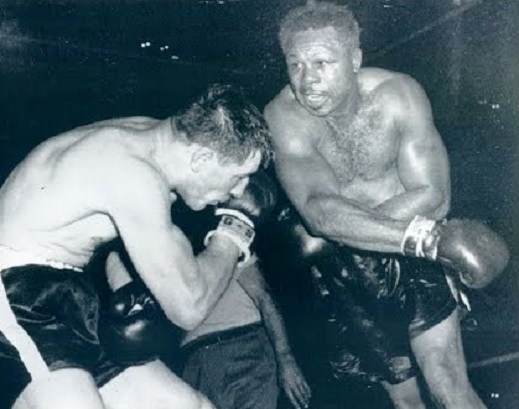 Moore is rightfully revered primarily for his caginess, longevity and power, but while he had suffered knockout losses in the past to Ezzard Charles, Floyd Patterson, Jimmy Bivins and Eddie Booker, on this night he proved his chin and recuperative powers were otherworldly. With 30 seconds left in round five, Moore landed a series of sharp jabs and then a huge right hand that staggered Durelle. The champion followed up with a left hook and two more rights and now it was the Canadian who needed to halt the action with a clinch. Moore got home another heavy right just before the bell. This was the turning point in the thrilling battle. 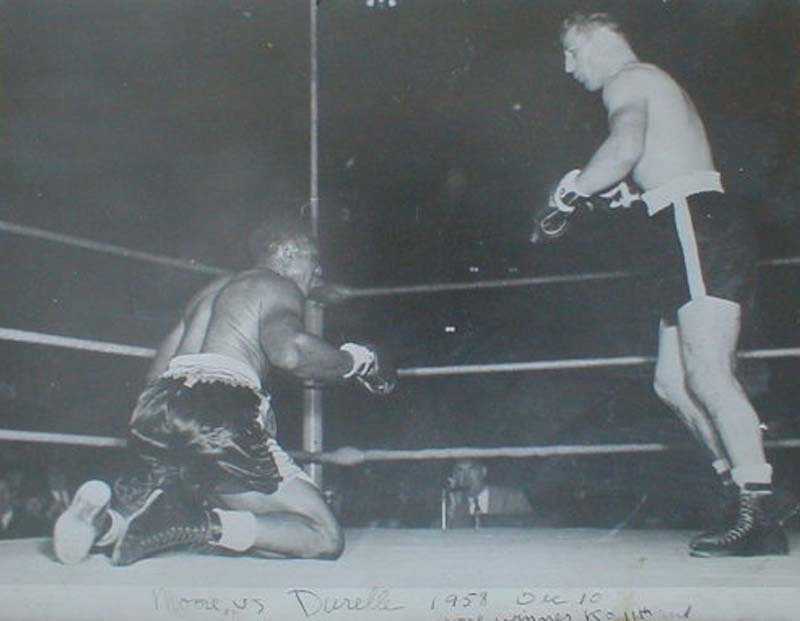 How deflating it must have been for Durelle to sit on his stool after five incredibly hard-fought rounds, knowing he had hurt and knocked down his opponent several times, but had somehow failed to gain control of the fight. His confidence likely took a further hit when he looked across the ring and saw the champion had chosen to forego his stool, Moore standing nonchalantly in his corner as if five brutal rounds of trench warfare and four knockdowns were just another day at the office. 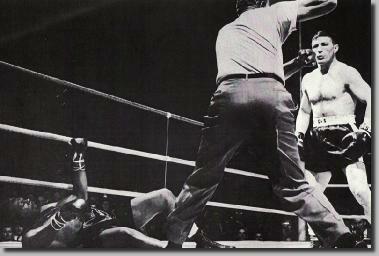 In round six, the astonishment of the crowd, Moore seized the initiative, controlling the distance and pace of the bout with a strong left jab and sharper footwork, not allowing Durelle to move forward but instead deflecting his attacks with pivots or by stepping inside to smother his offence. It was still a close and fast-paced round but now Archie appeared the fresher man, throwing and landing the more potent punches. And in round seven the tables officially turned as Moore, after landing a series of jarring left jabs, drilled Durelle with several flush right hands, staggering the challenger and then, at the end of the round, scoring a knockdown of his own. Durelle never gave up and he carried the fight to Moore in the eighth, but in the process was caught coming in by quick lefts and follow-up rights. Moore was timing Durelle’s right hand now, slipping and countering it with his own right and it was the champion’s punches that landed cleanly. Durelle’s last hurrah came in the ninth. 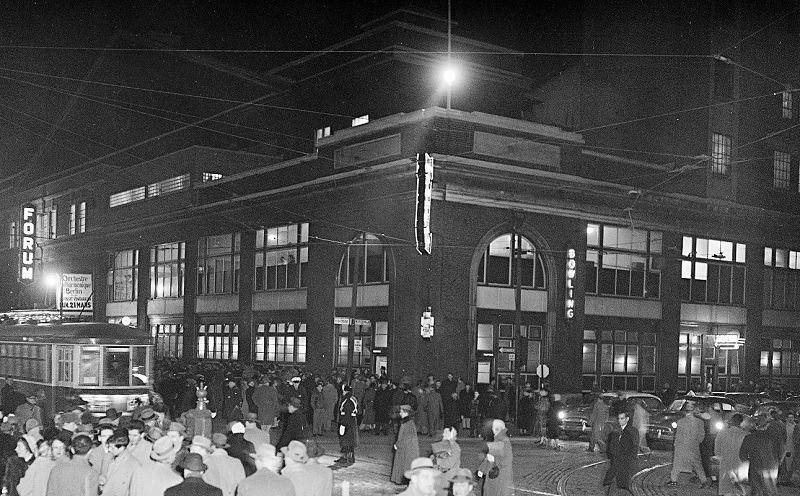 Bulling forward he stung Moore with a vicious right to the body; four more hard rights got home, two to the head and two to the body, as the crowd rose up again and roared, but then the champion halted the assault with a cuffing left to the jaw. Again, Moore’s recuperative powers came to the fore as he took command and backed Durelle up, trading power shots with the younger man and getting the better of the exchanges. 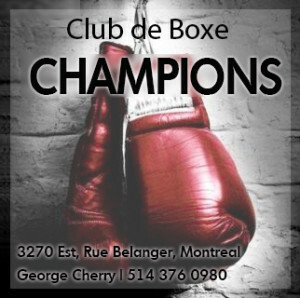 It had been a wild, glorious, punch-filled brawl but round ten marked its denouement even as Durelle continued to throw heavy leather, hoping to hit the jackpot again with that sledgehammer right. Instead, a series of blows had the gallant challenger all but out on his feet before a left hook sent him to the canvas for the second time. The bell rang before the challenger could be counted out but the contest was over; Durelle had nothing left to give. Still he started the final round aggressively, throwing loaded right hands, but Moore rolled with the punches and then pivoted to put Durelle off balance and wide open for the champion’s counter shots which sent the tough Acadian down for a third time. With blood gushing from both his nose and a cut over his right eye, the brave challenger got to his feet and fought on, actually landing a hard left hand, before a left and right from Moore decked him again, this time for the count. One of the most savage and thrilling battles in the history of the light heavyweight division was finally over. 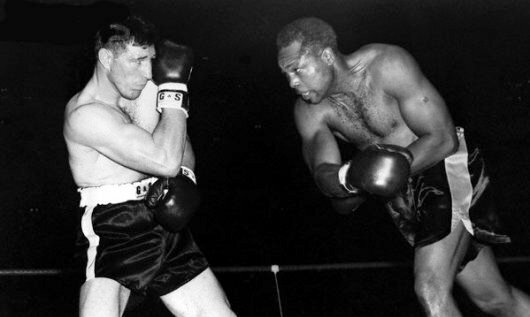 In the twilight of his long and historic career, the indefatigable Archie Moore had added perhaps its most memorable chapter, a rousing and violent discourse on its greatest themes: courage, resilience, and yes, perseverance. A lesser fighter would never have survived the opening frame and only a truly great champion, albeit one in this case who was years past his prime, could have slugged it out with the rugged Durelle for ten more brutal rounds to then emerge from the struggle victorious. 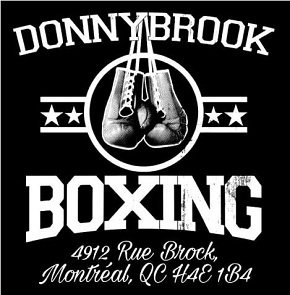 Up to this point Montreal had seen more than its share of great fights and fighters over the decades. Beau Jack, Joe Jeannette, Ted “Kid” Lewis, Sixto Escobar, Jake LaMotta, Sandy Saddler, Kid Chocolate: all had plied their trade in “Sin City.” But doubtless none of the countless battlers who had passed through The Fight City had ever given boxing fans a more dramatic and heart-stopping clash than was witnessed on a cold winter night on St. Catherine Street almost 60 years ago. 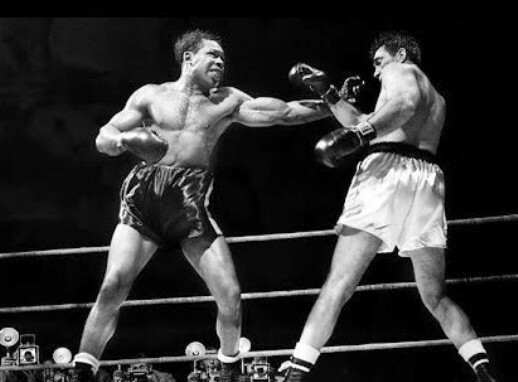 The bout has only grown in stature over the years and is generally regarded as one of the greatest fights of all time. I remember seeing this fight on TV when I was 15. Totally amazed. In my opinion, Moore is one of the very best ever.